The Indo Mini Pro is lighter and has less surface area than the Indo Pro model. The Indo Board Mini Pro model is perfect for advanced riders who want fast and loose action so that they can perform tricks like ollies, spins, shuv-its, grabs, air drops, and more!. 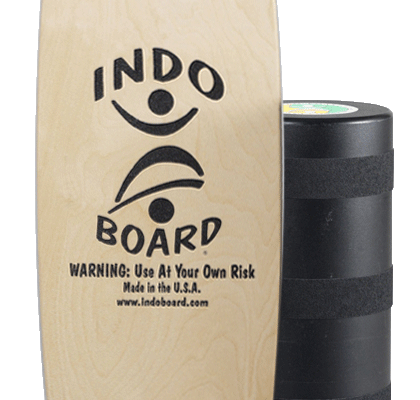 The Indo Mini Pro is ideal for snowboarders, wakesurfers, wakeboarders, and kitesurfers. The addition of the IndoFLO 24” Gigante Cushion in either the Pro FLO model or the Pro Training Package will allow the user to place the Gigante’ cushion under the deck (instead of the roller) and experience a fluid 360 degree range of motion that exactly simulates the rail to rail or heel to toe movement that is prevalent in board sports. Good balance and coordination are of paramount important for everyday activities. Everything from walking to playing sports requires balance. Studies have proven that balance can be improved at any age with the proper training. A strong core enhances balance and stability and can help prevent falls and injuries during sports or other activities. Balance Training creates a strong proprioceptive response when instability is encountered which is essential to improve athletic performance and everyday well being. Sports and active lifestyles require very good balance and stability. One of the easiest ways to improve sports performance is to create a strong, stable and well-balanced body.